It has been a while since my previous post, so I will begin by recapping my series on early modern Spain up to the point where we left off. This series focuses on an interesting debate between scholastics and novatores in Spain at the beginning of the eighteenth century, a debate which revolves around natural philosophy and methodology. The origins of the debate can be found in a book by Gabriel Alvarez de Toledo, Historia de la Iglesia y del Mundo (History of the Church and the World), where he tries to give an account of the book of Genesis which is consistent with the theory of atomism. This attempt to combine elements of the scholastic tradition with the new science was seen as a threat from the scholastic camp, which set out to criticize the book. Fransisco Palanco took advantage of this opportunity to go beyond a criticism of Alvarez’ book and set out to attack the novatores and the new science. The novatores quickly replied to Palanco, Juan de Najera and Diego Mateo Zapata responding with an attack on Aristotelianism and the scholastic ways. This exchange was the topic of our previous post, but it was not the end of the debate. In 1717, a year after de Najera and Zapata’s comments, the response from the scholastic camp appeared. 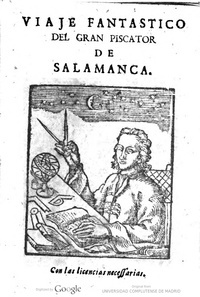 Juan Martin de Lessaca, a doctor from Toledo who was loyal to Aristotelianism, published Formas ilustradas a la luz de la razón (Forms enlightened through the light of reason [redundant as it is]). Lessaca claims that his book is a vindication of Aristotelianism in response to Najera and Zapata. The book consists of two parts: first a response to Zapata’s review, and then a response to Najera’s text. Lessaca begins his criticism by confirming a claim already made by Palanco, namely, that the novatores were guilty of heresy, based on their appeal to the new science. Here we have a clear contrast between the two movements: the scholastics found their research on ideas and the use of reason alone, while the novatores focus on experimental observation and the perception of the senses. Lessaca uses the distinction to point out that the novatores can be referred to as being “crude”, given that the senses are cruder than reason. Lessaca refers to those maxims held by the novatores to show the baseness of their methodology. Lessaca continues to criticize the novatores‘ emphasis on experience. He accepts that they might have an adequate knowledge of the human body, thanks to their attention to sensible experience, but they cannot rely on the latter “to discern those parts that cannot be seen, or touched, or accessed through sensible experience, and of this kind is all of the internal part of man, all that concerns spirits, their movement, nutrition, augmentation, etc”. The strategy here is not to attack the novatores on grounds of the faults of their method, but rather to point out that their method falls short when it comes to the knowledge of what cannot be experienced through the senses. Lessaca’s comments are of great interest to us because they give us specific arguments against the methodology of experimental philosophy. Beyond the charges of heresy, Lessaca does point out that experimental philosophy, though not completely useless, is too limited; the emphasis on experience and observation entails, from Lessaca’s viewpoint, that experimental philosophers were not capable of studying anything that went beyond the senses. And with this he flips the situation around: if experience and observation are our guides, then whatever we say about anything which escapes these guides becomes mere conjecture. In our research we have found many instances of the way experimental philosophers criticize and oppose speculative philosophers and their methodology. But examples from the other side of the ESD divide attacking experimental philosophy are scarce. This is where Lessaca’s work stands out, giving us some insight into the arguments adopted and promoted by speculative philosophers to defend their movement within the ESD. This is the final post on my first series on the debate between scholastics and novatores in early modern Spain. In the first post of the series I introduced two figures who had a heated debate concerning the status of astrology: Martin Martinez representing the novatores, and Diego de Torres Villaroel defending the scholastics. We saw that Martinez calls for a ban on astrology on methodological grounds. He criticizes those scholastics (specifically Villaroel) who rely on astrology for writing only from their imagination with no regard for observation and experiment. In the second post of the series we looked at Martinez’s arguments in more detail. We focused on his rejection of the application of astrology in natural philosophy. His attack revolves around the claim that the astrologers explain natural phenomena by referring to obscure causes where the phenomena in question are clearly accounted for by referring to evident causes. He shows that in medicine and natural philosophy there is no need to consult the stars. Villaroel was offended by this attack on astrology and promptly published his reply, Entierro del Juicio Final, y vivificacion de la astrologia (Burial of the Final Judgment, and revitalization of astrology). Juicio Final was the title of Martinez’s attack, and in today’s post we will examine Villaroel’s attempt to bury it. That Astrologers assign to each body part its Planet, or its star Sign, is not as dissonant as the Doctor [Martinez] judges; since in fact the analogy and conformity between the temper of the planets, and the cold, dry, wet, and warm parts of the wind, are such qualities not by the devotion of Astrologers, nor by their words, but because God made them that way, giving each its temper and quality: observation and experience, the mother of knowledge (which Martin lacks), has taught us so, as it taught our Masters; if not, let’s ask the Doctor: why is chicory cold? I believe he will answer, because God made it so, and gave it such quality. And I would ask further: has God told you which quality it has? No sir, he will answer (he is not so holy as to have revelations), experience has taught it to me and so have all Medical Authors. Well we astrologers say the same about the qualities of the Planets and Stars. Despite Villaroel’s insistence that it is through experience and observation that astrologers know the qualities of the planets and their effect on the human body, there is no reference at all to an observation account to support the claim. Instead, Villaroel blames Martinez for not properly studying the work of the authors cited by astrologers (traditional scholastic figures, such as Aquinas and Galen), and so his ignorance leads him to his unfounded criticism. I encountered then a Cartesian rascal, who told me with a hollow cough while stroking his beard: those influences you confer to the Stars are either occult qualities, which means you do not know if they exist, or they are evident qualities, and if so you are mistaken in not pointing them out. I replied to the Cartesian, identifying that his argument was as much of a cheat as him, and said: they are occult qualities to you, to Martin, and to all others who, not having studied them, ignore them completely, and because they appear occult to the ignorant, it does not follow that they do not exist, and they are evident qualities to those of us who have studied them, and we are not in error, since we point them out in our almanacs. Villaroel insists on replying to the criticisms by pointing out Martinez’s supposed ignorance, and instead of supporting his argument with data, he focuses on quoting authors that recommend the study of astrology to insist that Martinez is not only ignorant, but also a terrible physician. Villaroel refers to passages from the work of Galen, Avicenna, and Hippocrates, where they all comment on the necessity of the study of astrology for the proper exercise of medicine. But other than the quotes, Villaroel’s claims are not backed up by observation and experience, despite his claims that such is the source of the astrologer’s knowledge. This debate between Villaroel and Martinez has an interesting feature: it shows that there was more to the experimental/speculative divide than mere rhetoric. Both our authors use the rhetoric of the new philosophy, placing experience and observation as the only true source of knowledge; but while Martinez does refer to observational data to back up his explanations, Villaroel does not go beyond the authority of scholastic figures and their texts. What we have here is a clear case of the two sides in the ESD, where the experimental methodology supported by Martinez is contrasted with the speculative ways of Villaroel. Stay tuned for further posts on the ESD in early modern Spain! !